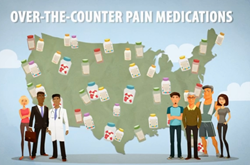 The Alliance for Aging Research has debuted two animated “pocket films” focused on educating consumers about how to safely choose, take, and store OTC pain medication. Every year, millions of Americans reach for one of the hundreds of available over-the-counter (OTC) pain medications to find effective relief from minor aches and pains for everything from the common cold to the minor pain of arthritis. Acetaminophen and nonsteroidal anti-inflammatory drugs (NSAIDs) are the two main types of OTC pain medications, found in pain relievers, fever reducers, and sleep aids, as well as many cough, cold, and allergy medications. They are available in name brands, store brands, and generics—as well as prescriptions. OTC pain medications are effective and generally safe when used as directed. However, just because they are available without a prescription does not mean they are harmless. The Alliance for Aging Research has debuted two animated “pocket films” focused on educating consumers about how to safely choose, take, and store OTC pain medication. The films are an accessible educational resource for patients to view on their own, as well as for medical professionals and health care facilities to use in waiting rooms, in consultations, and at health fairs. The films, along with additional resources on drug safety, are available for viewing here and for direct download here. They were produced with support from McNeil Consumer Healthcare. A press kit is available here. The Alliance offers a complete library of short, animated "pocket films” on a wide range of health conditions and topics, many with an emphasis on older adults. The Alliance for Aging Research is the leading nonprofit organization dedicated to accelerating the pace of scientific discoveries and their application in order to vastly improve the universal human experience of aging and health. The Alliance was founded in 1986 in Washington, D.C., and has since become a valued advocacy organization and a respected influential voice with policymakers. Visit http://www.agingresearch.org for more information.